We thought we had tackled the toughest portion of the Caminho Da Fé in the Brazil 135 Ultramarathon. 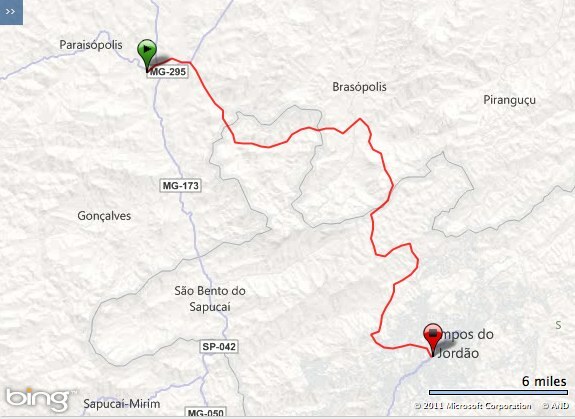 Out good friend Gustavo Netto, who has biked many portions of the Caminho Da Fé, told us otherwise. 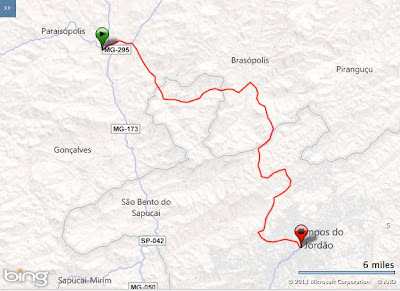 He suggested that we only cover the distance to Campos do Jordão, describing to us the difficulty of the so-called "Hill of the Broken Leg." Gustavo was dead on. We started the day with a great surprise. Michelle, Ashley, Clovis, Clovis's Wife, Mario and several others came out to wish us well. The first mile felt as if it took an hour, but we soon settled into a groove. While climbing the "Hill of the Broken Leg" we were treated to a delicious meal made for us by one of the local residents. The well needed break provided one of the more comical moments of the journey, as Glauber, working the video camera, got bored with the commentary Chris was providing and simply panned away. To this day we still believe that Glauber can understand and speak English. The nearly 40 miles that we covered on Day 7 took nearly 13 hours. The elevation profile tells it all. It would be an amazing finish to a 7 day, 14 hour journey. The eve of our last day was spent at the best pousada - the proprietor greeted us with shots of Cachaca and plenty of beer. A pizza feast at night was followed by an amazing breakfast that was fully prepared and waiting for us when we woke. We began the day with a beautiful view as we prepared to cover a nice chunk of the final 40 miles on an old railroad track. Glauber told us the tracks were not in use. When I saw several people working on the tracks up ahead, I had my doubts that Glauber was right. He wasn't, and we soon had to make way for the oncoming train. There was an annoying section that was covered entirely with large rocks. It was probably the first time I'd seen Chris not happy and quiet. 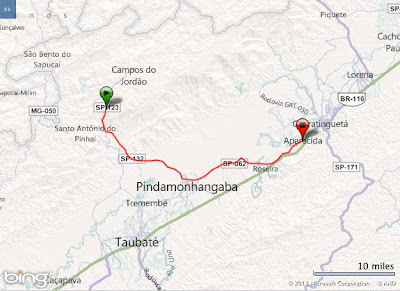 The last 50k was extremely challenging as it was entirely on heavily trafficked highways. And, it was so fitting that the last 6k featured an intense wind-driven downpour that had all three of us searching for shelter (to no avail). With about 2k to go we were joined by Mario and his brother. They had driven a great distance to see us complete the pilgrimage. Walking through the parking lot of the church, and then into the church itself, was so surreal. What we had started 7 days and 14 hours earlier, was now over. We could not wait to get through this ankle-twisting section. Here are my feet in a picture taken when at the hotel on the night we finished. 7 days, 14 hours, 340-some miles...not too bad. I used Drymax Lite Trail Running Socks the entire time. We would return to the Basilica of the National Shrine of Aparecida the following day to receive our "Mariana" (Certificate of Pilgrimage). There are a tremendous number of folks to thank for helping to make this pilgrimage happen. For starters, our sponsors - The Challenged Athletes Foundation, Phix Energy Drink, Drymax Socks, and Cleanse Organic. Phix has continued fund raising efforts in support of CAF by pledging a donation for each Facebook fan that signs up for a Phix free trial - follow Phix on Facebook, and go to the Free Trial + $1 Donation to CAF page for more details. Our tremendous support crew - Lynne, Glauber, Clovis, and Clovis's Wife. Without the help of these amazing people the 3 of us would likely be still wondering on the Caminho Da Fé. Each of these great people devoted time from their already busy lives to support our journey, and we are forever grateful for their kindness and generosity. 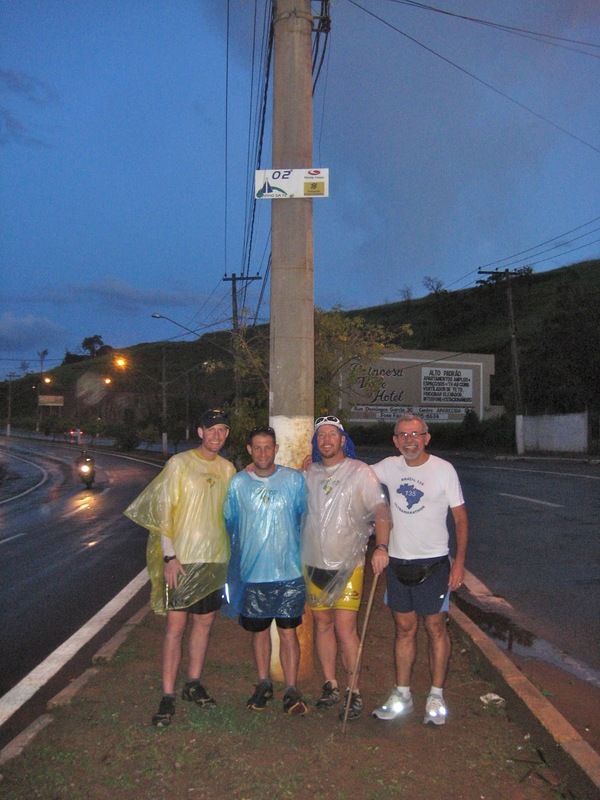 Mario and Eliana Lacerda, the race directors of the Brazil 135 Ultramarathon, and their entire staff. Their support and encouragement began when this idea was hatched at the 2010 BR135, and it continues to this very day. Our families and friends, and everyone that has supported, in one form or another, the Challenged Athletes Foundation - may you continue to assist CAF in recognizing "the athletic greatness inherent in all people with physical challenges" and support "their athletic endeavors by providing unparalleled sports opportunities that lead to success in sports - and in life." My feet often look more busted up than that after just a marathon. Ha! Again, that's an amazing run you all did. Thank you for sharing the stories/photos/videos with us all. This one certainly qualifies as epic, on every level. Well done! Well done!